It's a practical habit of my profession to categorize by likenesses and to corral books into thematic units. That way, when we're* assigned amorphous courses to teach—Studies in Canadian Literature, say, or Studies in Contemporary Literature—and know that we need to order books well before the courses they belong to actually take place (the assignment arrives in February for courses beginning the following September and January), there's a stock of titles that 'fit' together and lead to a course offering some kind of conceptual coherence. *Okay, this "we're" is pure speculation. Really, I have no idea if that's how other lecturers approach reading. It's not an absurd guess, though. Anakana Schofield's debut novel Malarky made me laugh aloud several times. Our Woman, its sometime narrator, has a, well, bracing Irish sense of humour and undiplomatic way of communicating her thoughts. And Schofield's account of Our Woman's mental troubles, marital and parental woes, and sexual home-schooling (taking place mostly in rural Ireland) is remarkable for the comfort it shows with moving between extremes—giddy hilarity on the one hand and the depths of sorrow on the other. 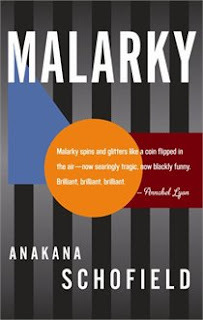 Fiction that came to mind while reading Malarky included a number of women-at-the-edge novels with unconventional approaches to narration: Jackie Kay's Trumpet, Audrey Thomas' Mrs. Blood, Don Hannah's Ragged Islands, and Daphne Marlatt's Ana Historic. Margaret Laurence's The Stone Angel is there too, of course. Thematically, Schofield's novel would also be good company with Suzette Mayr's terrific Monoceros. The grouping here is not meant to suggest Malarky owes any kind of debt to the other titles. That's not the case. Schofield's exploration of her character's plight stands on its own.